Roger's Gardens is one of my favorite places to go Labor Day weekend, since this is when they unveil their Halloween exhibits! Roger's Gardens is a high-end garden center, but this time of year they transform some of their rooms into showcases for all sorts of Halloween decor. Elaborate facades are put up to invoke the eeriest atmosphere, and high-end Halloween art and decor is put on display for all to enjoy. 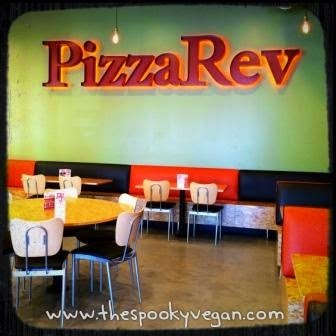 A fellow Orange County vegan clued me in on PizzaRev, a new pizza place that opened up near South Coast Plaza in Orange County. PizzaRev has other restaurants in SoCal (and are planning on expanding to other parts of the nation), but this is the first one I had ever heard of! They have a build-your-own pizza system, with a counter set-up much like Chipotle’s, where you tell your server what kind of crust, sauce, and toppings you want for your pizza. 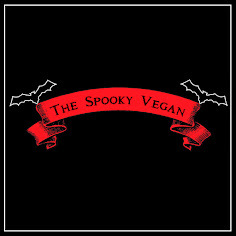 They are not a vegan restaurant, but they do offer vegan options! were EVERYTHING! So creepy cute! Pier 1 Imports have had their Halloween items for a few weeks now, so I decided to stop into one of their stores to survey their selection. 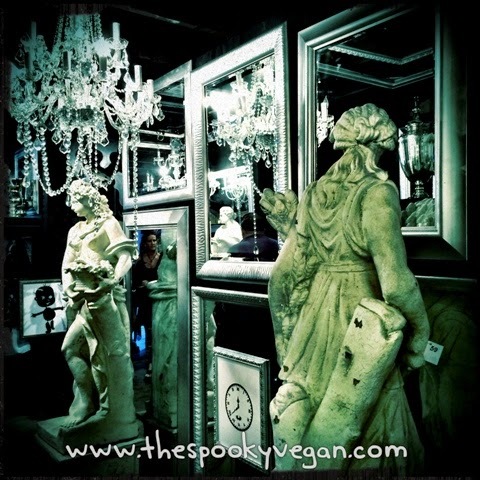 While they sometimes have cool stuff, I generally don't make it a priority to visit their stores since their items tend to be either covered in glitter or too expensive (or, heaven forbid, both!). However, a Halloween pal posted an adorable jack-o-lantern mug she found there and I had to visit, if for nothing more than to get that mug! Almost every Halloween season Oreo seems to release a new flavor - the past two years I have enjoyed the Candy Corn Oreos around the autumn season, but this year Oreo has released a new flavor, Caramel Apple, which is already available exclusively in Target stores. 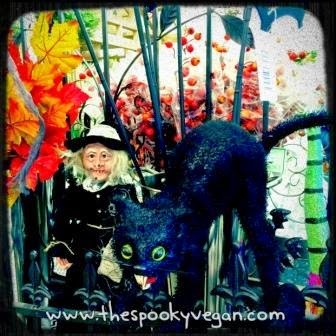 This black cat was totally creepy cute! TPT Home is a home decor store located in Costa Mesa, CA that usually has a great selection of Halloween décor, tableware, artwork and more this time of year! They recently moved to a smaller location (just a building over, they are still located by the SoCo Collection), and unfortunately their Halloween section has also shrunk. They still have some neat items, but the selection is much more limited than it was in past years (and lots of it seems to be coated in glitter...yuck). It always seems like I am finding new vegan items to try at Trader Joe's, and I recently discovered this Uttapam with Coconut Chutney in the frozen food aisle! I had never seen it before, so I had to try it. As luck would have it, I was feeling particularly lazy the other night, so I decided I would try this easy-to-make uttapam. By the way, before I picked this up I had no clue what uttapam was (I really need to eat more Indian food), but from the box I learned that the rounds pictured on the front are rice breads topped with onions and cilantro. It sounded like quite a tasty, light meal, especially with the coconut chutney! There are tons of new artisinal vegan cheeses popping up, much to my delight (and to the delight of other vegans)! These vary from Daiya’s delicious and economical cheese spreads to the pricier Kite Hill, Treeline or Punk Rawk Lab cheeses. I hadn't really had the opportunity to try many of the artisinal cheeses, either due to high price or not being able to find them, but recently I discovered Parmela Creamery’s cashew-based cheeses! I found them at Whole Foods, and since they were only around $6 a tub, decided to splurge a little and have my own cheese and crackers party! UPDATE: Unfortunately, this restaurant has closed. Attention UCI and Orange County vegans! Berkeley Dog, located on the UCI campus near Trader Joe's and Veggie Grill, has two vegan sausage options! I'm not sure how long these have been available, but after visiting the location with some non-vegans a few weeks ago, I was ecstatic to see "veggie dogs" on the menu. I heard the best news last night! 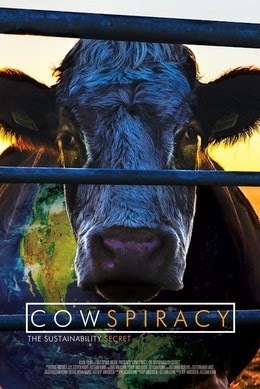 The documentary Cowspiracy: The Sustainability Secret, is scheduled to screen in Huntington Beach, CA on Thursday, September 4th, 2014! However, there is a minimum amount of pre-sale tickets that must be sold before the screening of this fine documentary can happen, so please buy your tickets now! I have been stalking my TJ Maxx/HomeGoods store for the last couple of weeks, just waiting for them to start putting out their Halloween decor (I was told by a few stores that their Halloween stock was delayed this year, which explains why I haven't seen any yet)! I called them yesterday, and lo and behold the sales person told me they had just started stocking the shelves with Halloween stuff! I headed to the store (for those interested, this is the TJ Maxx/HomeGoods store in Irvine) ASAP, filled with eager anticipation at what I might find. When I finally found their Halloween aisle (just one aisle for now, though I'm sure more will come! ), I found they weren't foolin' when they told me they had JUST started stocking their shelves. Everything looked like it had just been thrown (as in literally tossed) haphazardly on the shelves. There was broken glass, and some of the merchandise was wet (hmmmm...maybe a snow globe had broken or something else was spilled?). I really had to dig to find worthwhile stuff, and it seemed like most of the decor was Halloween art painted on wooden signs (which I love, by the way, but there was a lot of it!). I was lurking around Costco the other day and they had a few Halloween items out - woo hoo! It wasn't much, but they had a pretty orange lantern, some autumn wreaths AND their much-coveted Pose-n-Stay Skeleton! Squuuuuueeeeeee...I had heard rave reviews about this guy and that he tends to sell quite fast, so I just had to have him. I snatched him up right quick and placed him in my cart, and spend the entire shopping trip getting odd stares from strangers and jaws dropping from little kids...but I'm used to that anywho, so nothing new there! 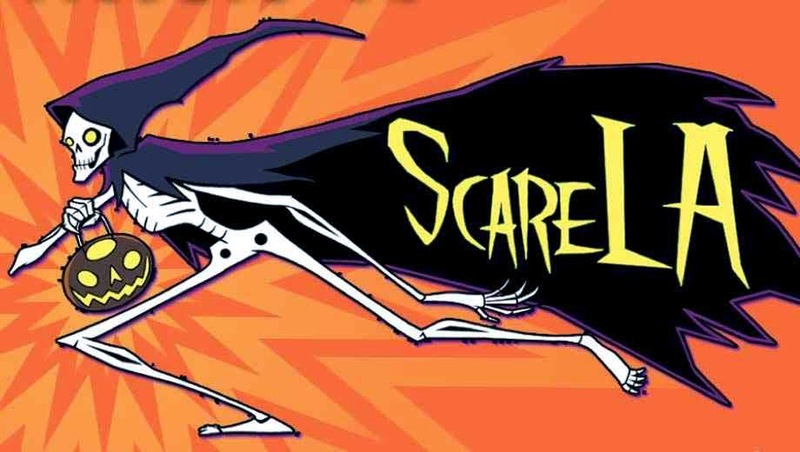 ScareLA, a Halloween/horror convention, returns for its second year this weekend on August 9th and 10th, 2014! 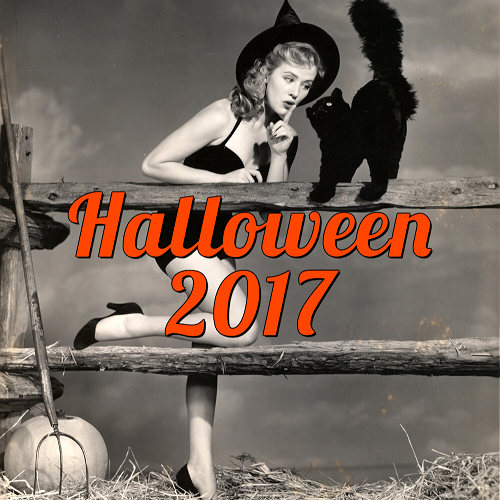 It has the hallowed honor to be the first Los Angeles convention dedicated to celebrating Halloween. 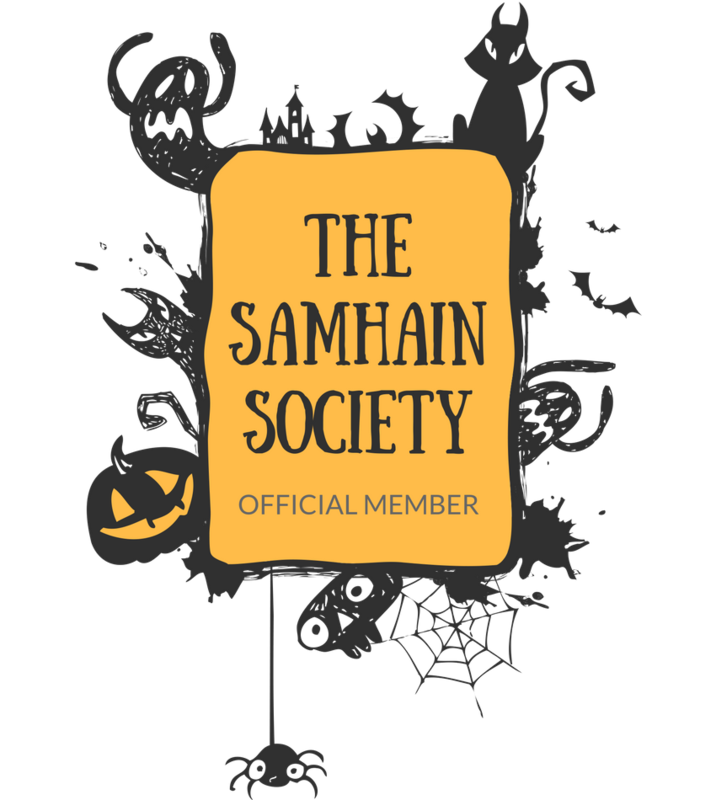 The event attracts tons of haunt industry professionals, haunt enthusiasts as well as Halloween and horror fans! The event boasts top attraction designers and operators, manufacturers, artists, filmmakers, musicians and much, much more. Vegan Oktoberfest Tickets Now On Sale! The coolest news was announced a few weeks ago - a Vegan Oktoberfest is coming to SoCal on Saturday, October 4th, 2014! All the beer, all the German food, ALL VEGAN! Over the last few weeks, Vegan Oktoberfest's Instagram, Facebook, and website have announced lots of exciting news, like participating breweries (so far they have Drake’s, Angel City, Golden Road, Anderson Valley, Saint Archer, Bravery, Karl Strauss, Lagunitas, Oskar Blues, Bison Organic Beer, Modern Times, Epic Brewing and more to come) and food vendors (so far it's Sage Bistro, Southern Fried Vegan [who is hosting the event], plus Urban Pie [German pizzas! ], Dogtown Dogs, Kind Creme, Divine Dips Ice Cream, Pop ‘n Mamas Kettle Corn and Funnel Cake, Life Is Sweet Bakeshop and more to be announced)! 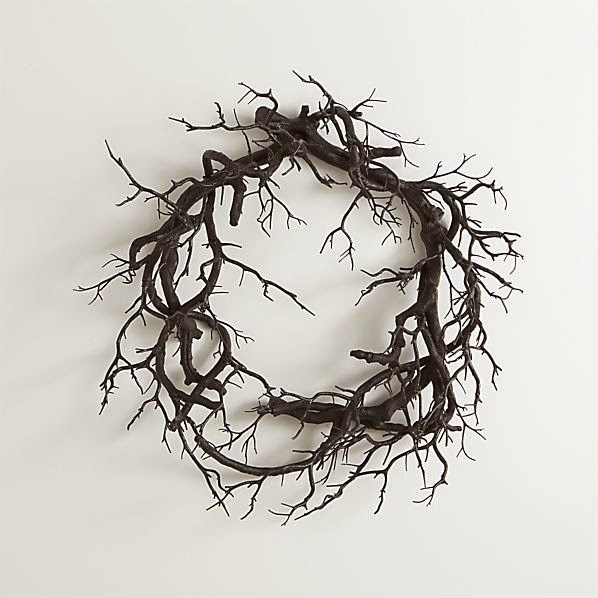 I've already posted about the Halloween 2014 collections from Williams-Sonoma and Pottery Barn, but I just discovered that Crate and Barrel has their Halloween items posted, and I think they are my favorite out of these higher end stores! I wish I could buy everything in this collection, but for now I shall have to resign myself to drooling over their online store and trying to hold myself back from pressing the "add to cart" button. Le sigh. I could probably make it on my own for much less. I have always wanted to attend Heritage Square's Victorian-inspired event, and I'm hoping I'll actually be able to attend this year! During a weekend in October, Heritage Square, located in Los Angeles, offers Halloween and Mourning Tours, where guests can learn about Victorian death and mourning rituals and etiquette, plus the movement of Spiritualism and how other cultures and time periods celebrate the deceased. They have actors in period costume recreate Victorian scenes involving death, mourning, funerary customs and spiritualism rituals. Heritage Square itself houses authentic Victorian Era buildings, so it is the perfect setting for the event. I know that using apple cider vinegar on your hair might seem odd, but trust me, this stuff is incredibly effective at conditioning your hair and balancing the pH levels of your scalp, resulting in shiny, smooth, well-conditioned hair and a healthy scalp! I have been using this treatment about once or twice a week for over a year now, and have gotten multiple requests to share this easy, cost-effective method, so here goes! Williams-Sonoma has posted their Halloween preview up on their site, though I'm hoping they will have more stuff available soon. 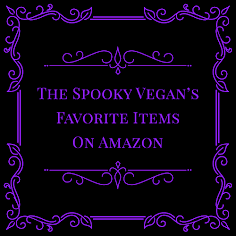 Right now there aren't too many items I'm interested in (lots of non-vegan food, harvest-inspired tableware, etc. ), though there is some tantalizing tableware I dig! I feel like many of their designs are more gothic than Halloween, but hey, I like that, too! a set of four. I love the Victorian-inspired design! I finally got around to checking out a Michael's store the other day for Halloween items, and I wasn't disappointed! Though not everything was out yet, I think they had about 80% of items out. I feel like this year either they are a little late in getting Halloween stuff out or I am late in checking out their Halloween stock, since I usually have a post like this up in mid- to late July. Nevertheless, I was ecstatic to see 2014 Halloween items in a store! I usually get so excited when I see my first Halloween pieces of the year that I tend to go a little overboard...however, I tried to restrain myself this year. I walked away with a few items, but certainly didn't go as crazy as I usually go (though I have a feeling I will be back for more!). Below you'll find some pics I took while wandering around Michael's Halloween section, as well as what I ended up purchasing (my first Halloween purchase of 2014!!). I always love the skellies! Pottery Barn has unearthed their Halloween 2014 collection and some of the pieces are to die for! The main themes this year are skeletons, Game of Thrones-inspired medieval dragons, and mad scientist lab (I didn't like any of those pieces, so you won't see them below). As usual, most of the pieces are too expensive for me, but a ghoul can still dream, right? Check out some of my faves below and view the whole collection on Pottery Barn (disclaimer: all photos are from the Pottery Barn site)! These jack o' lantern lights remind me of Sam from Trick 'r Treat! They are $39.50 and only available online.